Ideal for depths up to 36 in. (91 cm) deep and 3.5 in. (8.9 cm) wide, the OptiCut digging system uses a low-profile tooth design for a smoother cut with less wear on the chain. Ditch Witch's OptiCut digging system enhances walk-behind trencher productivity in all soil conditions. The digging system complements contractor and rental company equipment with maintenance-free teeth and 19,000 lbs. of tensile strength. The all-in-one chain design features integrated tooth technology to ease operator maintenance. The design matches the life of the chain by eliminating one-by-one tooth replacement and associated replacement costs for reduced maintenance downtime. Ideal for depths up to 36 in. (91 cm) deep and 3.5 in. (8.9 cm) wide, the OptiCut digging system uses a low-profile tooth design for a smoother cut with less wear on the chain. Another feature that distinguishes the OptiCut from other chains is the oversized roller design, which greatly reduces friction and boosts the horsepower available for digging. 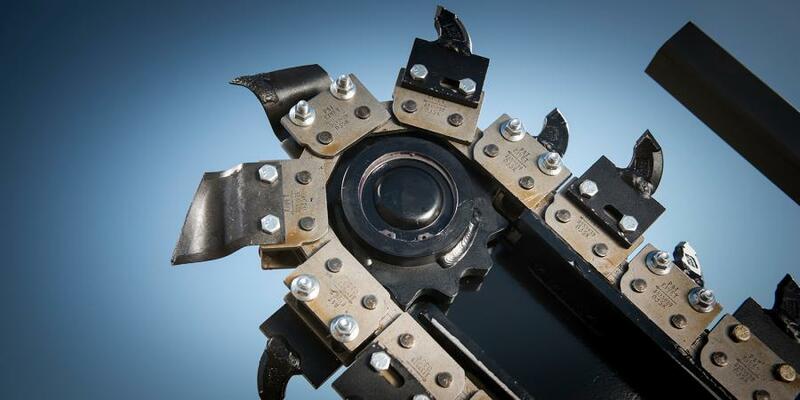 Available tooth configurations include a 4-pitch DuraTooth, a 2-pitch Shark and a 2-pitch DuraTooth/Shark combination to meet the needs of any soil condition. Sprockets extend the life of the chain by utilizing a mud-relief design for improved cleanout and more even roller wear, according to the manufacturer. To handle different operating conditions, the digging system is made for strength and ductility. Designed with the highest quality alloy steel and precision tooling, the chain's overall performance is improved and equipped to handle higher loads over a wider temperature range. The OptiCut digging system is compatible with the new Ditch Witch C12, C14, C16, C16X, C24X and C30X walk-behind trenchers, but can be adapted to other makes and models through the use of a special conversion sprocket. For more information, visit www.ditchwitch.com.